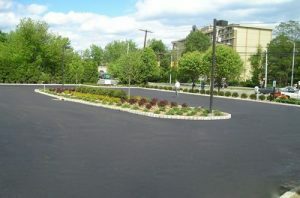 All Star Paving and Sealing have been installing, replacing and maintaining parking lots since 1999. Matt Forte and T.J. Koester are the principal owners and have been in the industry for over 20 years each. When buying a service from All Star you are buying it from them. Property owners and managers quickly realize they are dealing with a knowledgeable and professional outfit. After experiencing their level of service All Star will be your preferred parking lot maintenance and construction contractor. You will deal directly with the owner from your first consultation through the completion of your project. Not only do you get their expertise and professionalism during the planning and execution of your project you also have them for the future. Should you decide to seal coat and maintain your parking lot, we are here to serve you. The next hurricane rolls through and a tree up-roots part of your parking lot, we are here to serve you. Ten years from now when you call the office, again, you will deal directly with Matt and T.J. We want our clients to think of us when you think about your parking lot. All Star utilizes the industry’s highest technology. Each piece of our equipment is the best in its class. Our personnel has been trained for the tasks they perform by Matt and T.J. personally. This ensures all services are performed to the highest standard. All Stars personnel also go through safety training on a yearly basis. All of these things plus the added value of dealing directly with Matt and T.J. are what set us apart from our competition. When it comes to parking lot paving there is nothing All Star can’t do. Most of their parking lot work is removal and replacement. This is when they remove all the existing asphalt and re-establish the base material. Finally, the parking lot is paved with hot mix asphalt. All Star also performs overlays which is when we pave over an existing parking lot. Every client and their situation is different. Proper analysis of your needs and your parking lot are necessary to recommending the right service for you. For those who want the added beauty of granite curbing or pavers, All Star has a mason crew that is second to none. Our concrete team focuses on flat work including concrete curbing and sidewalks, granite curbing and pavers, concrete pavers, flagstone and stone work. We offer consulting services for design and can work with your landscape designer to make your dreams a reality. All Star and its owners will not disappear after we install your parking lot. We want our clients to turn to us for seal coating, patching, crack repair and striping in the future. Proper maintenance and repairs will extend the life of your asphalt surface. We offer a complete maintenance package that comes with every paving job. You will get a yearly alert via email after we’ve paved your parking lot. This will remind you that it’s time to have All Star out to take a look and see if anything is needed.